As expected, the web browser in Ice Cream Sandwich has gotten an update and it is now faster than before, with significantly improved performance in benchmarks over the previous version of the browser. It also adds some useful features such as the ability to sync bookmarks with the Google Chrome browser and an incognito mode, where the browsing history is not saved, a feature that should be more useful on a tablet than a phone. Other changes include the ability to request the full version of a website instead of the mobile optimized version, a feature that you may have noticed on Opera Mobile before. The browser can now also save pages on the phone for offline viewing, another feature found on the Opera browser. Lastly, the Ice Cream Sandwich now shows a vertical stack of thumbnails for open windows that resemble the icons in the multitasking menu. Also, just like in the multitasking menu, you can close windows simply by swiping right on them. Ice Cream Sandwich features a new camera application. Other than the new user interface, it adds some useful features, such as continuous focus, tap to focus, face detection, image stabilization and panorama mode. There is also a new zero shutter lag exposure, which reduces the shot to shot time considerably. The video recorder also gets some useful features such as continuous focus while recording, ability to zoom and take a snapshot while recording and a new time lapse feature. Image stabilization also works during video recording. As you read before, the camera app can now be quickly launched from the lock screen. We were generally impressed with what we saw today. 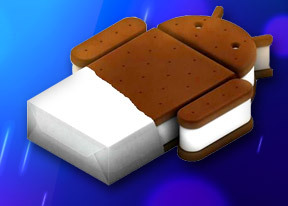 Android seems to be heading in the right direction with Ice Cream Sandwich. It tackles some of the longstanding issues such as fragmentation head-on and if adopted quickly by OEMs should make the life of developers and in turn the users a lot better. It also takes the stock Android Gingerbread and makes it a lot more functional. Features like the new lock screen, improved camera app, new notifications, ability to take screenshots, hardware acceleration for the UI, improved text and voice input, etc. will certainly go a long way in making the Android user experience richer. Although Honeycomb users have had some of the features we saw today for a while now, it is nice to finally have them on the humble smartphone as well. But how does it stack up against the competition? Well, Android was the most feature-rich mobile operating system around and Google just went and added a ton more, so it’s certainly ahead of the competition in that aspect. But how good is it to use in the everyday life? Is it as user friendly as iOS or Windows Phone 7? Will it finally make people get over the stigma of Android being inherently a geek’s OS? Well, that’s something we can find out only after a full review. So keep watching this space.